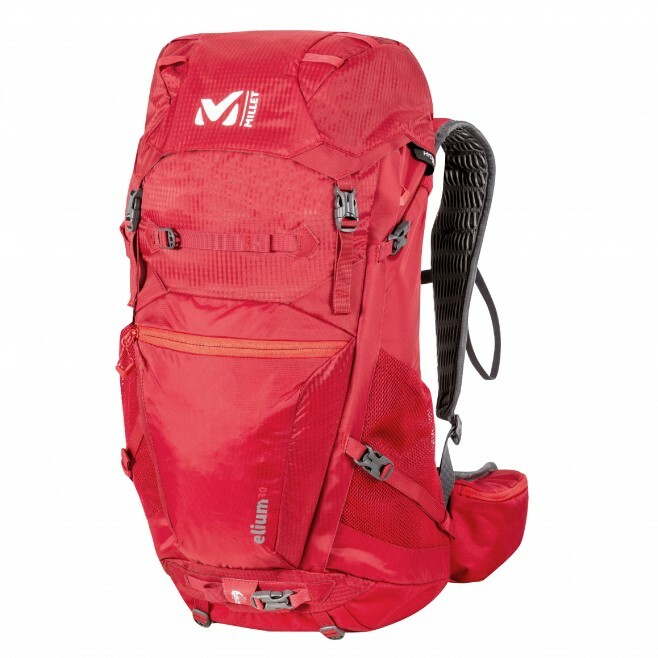 Devoted to outdoor enthusiasts and 2-3 day excursions, this 30L alpine backpack is for high-tempo summer hikes. The AIRFLOW SUSPENDED build, with a mesh structure stretched on the back, increases bre athability and comfort by forming a slight gap between body and load, to accelerate air circulation. With a narrow shape that frees up movement, the ELIUM 30 is suited to mountain travel on diverse terrain. The carry system is comfortable and breathable, with perforated, padded shoulder straps and a hip belt with ventilated mesh covering. The core themes of the ELIUM 30? Strength, lightness, stability. The side access to the internal compartment is direct: you access your stuff quickly, effortlessly, and without having to open the lid. With the QUICK AXE and SPEED POLES systems, ice axes and poles are quickly secured and released, without taking off your pack, for greater flexibility on the move. Built-in waterproof rain cover, compression straps, and hydration-compatible pocket - everything's geared to maximum autonomy out on the ground.